Pact stating that the two countries - Germany and the Soviet Union - would not attack each other. The Nazis and the Soviets kept the terms of the pact and the protocol until Germany's surprise attack and invasion of the Soviet Union on June 22, 1941. Oh the trickery. 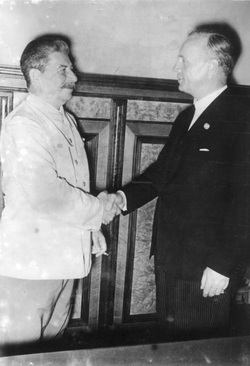 The economic agreement committed the Soviet Union to provide food products as well as raw materials to Germany in exchange for furnished products such as machinery from Germany. stated that the two countries - Germany and the Soviet Union - would not attack each other. Because of the Nazi-Soviet Non-Aggression Pact, the Soviets did not join the fight against Germany, thus Germany was successful it its attempt to safeguard itself from a two-front war. The Nazis and the Soviets kept the terms of the pact and the protocol until Germany's surprise attack and invasion of the Soviet Union on June 22, 1941.